This posting features some of the images Conrad has shared in small installments on facebook during the last month. 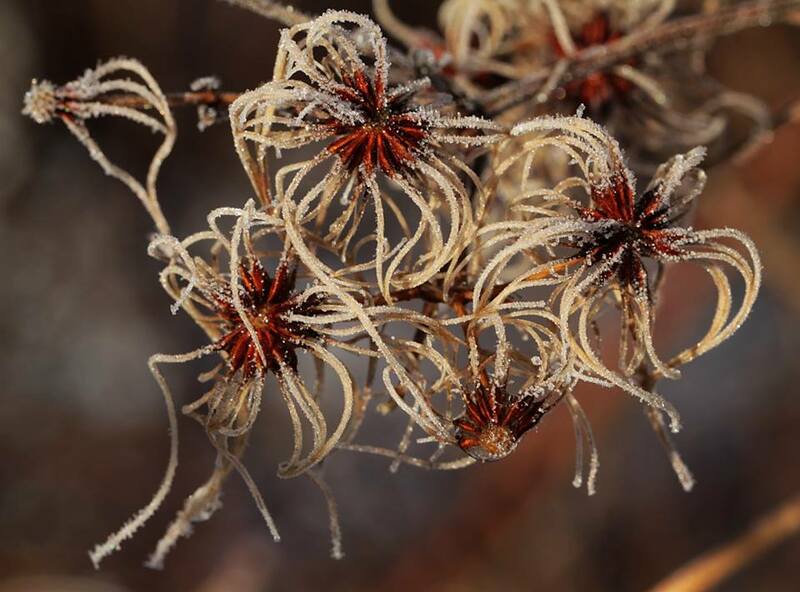 So, if you periodically look at the Farmscape Ecology Program Facebook Page, most of this will be familiar… If you haven’t yet seen these images, we hope you enjoy them! But before I share some of our favorite memories from this long winter with you, I want to put this “cold and snowy” winter in context. Thanks to our local weather station, lovingly called the “Weatherpig”, after the favorite animal of its generous donor, we have a continuous (5 minute intervals) record of the weather right here at Hawthorne Valley for the past several years. 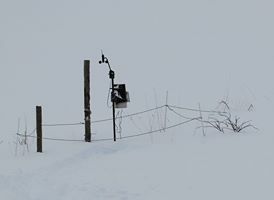 The “Weatherpig” weather station on a pasture at Hawthorne Valley Farm. 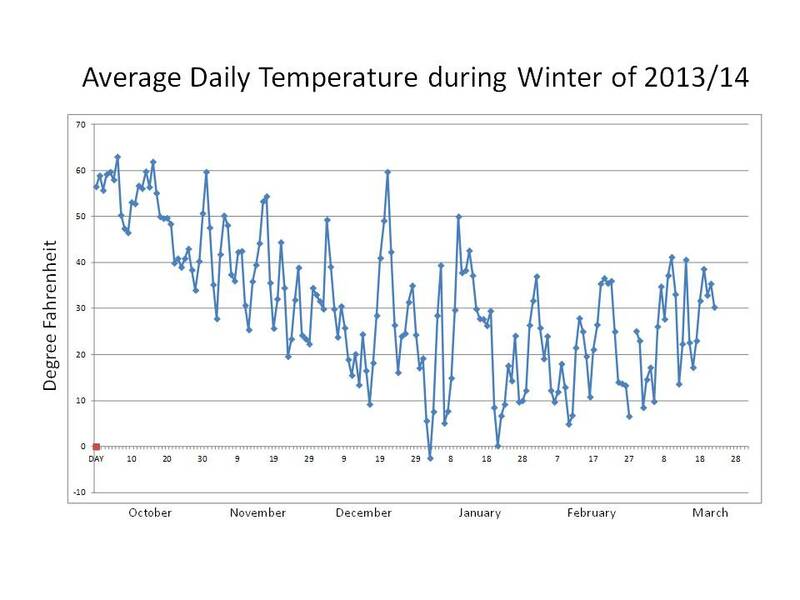 Average daily temperatures fluctuate enormously throughout the winter. 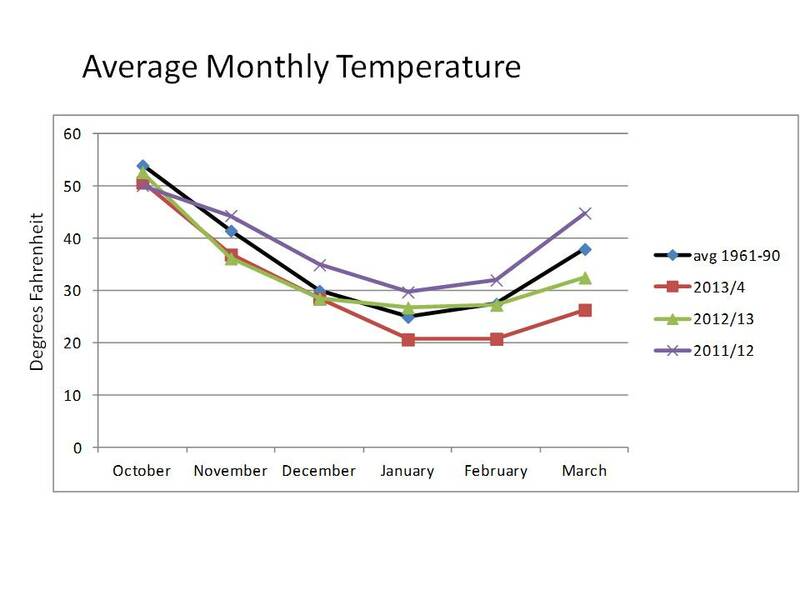 January featured the coldest days, but also had a warm spell (“January Thaw”). 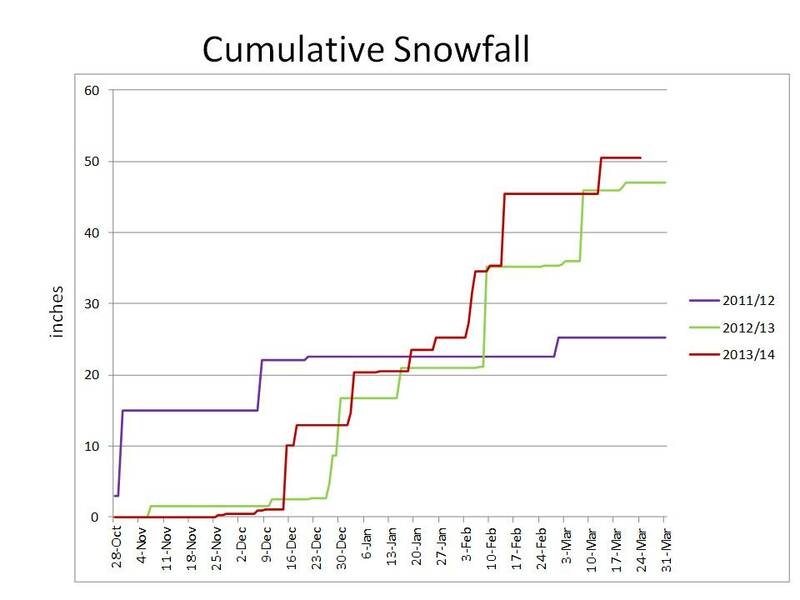 This winter, we got a total of 50 inches of snow, slightly more than last winter. 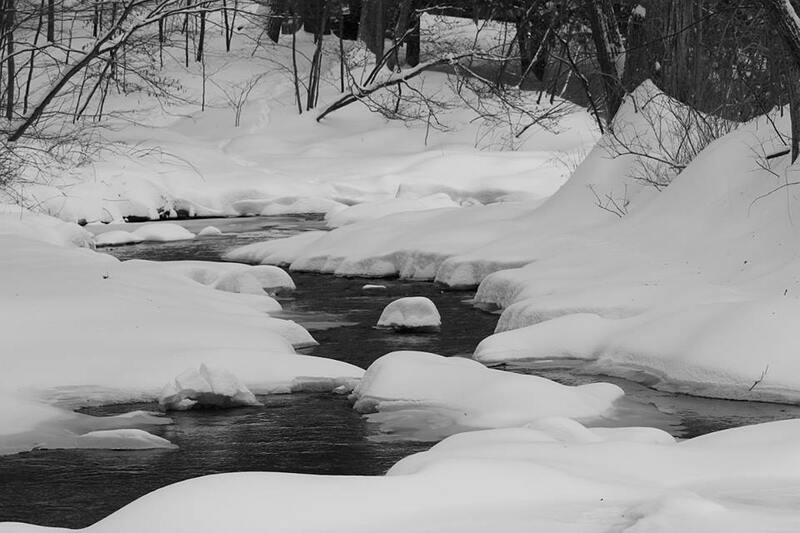 In the winter of 2011/12, snow came very early (remember the snow storm at Halloween?) and not much was added during the winter, totaling half the amount of this winter. But some creatures were out and about the very next day, having seemingly less trouble moving through the deep snow than we did. 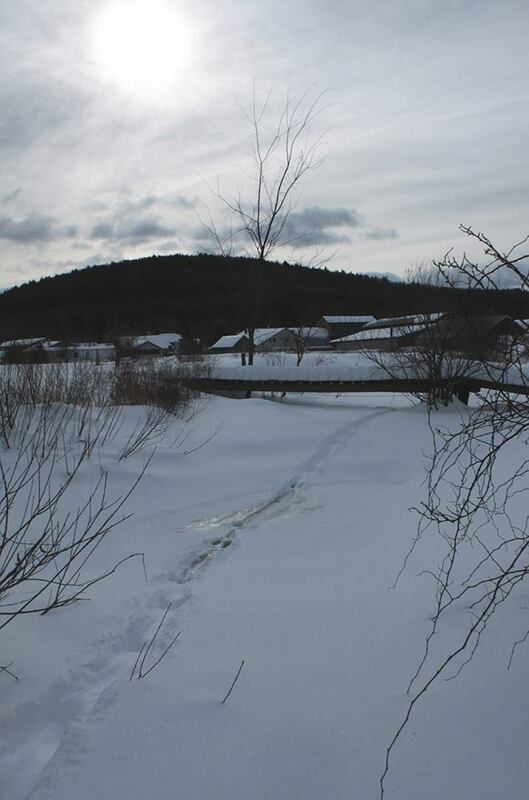 A River Otter traveled the length of the farm creek, switching back and forth between moving through the snow on top of the (mostly) frozen creek and through the water below the ice and snow. Skip and slide, and into the water… – How much fun is this??? 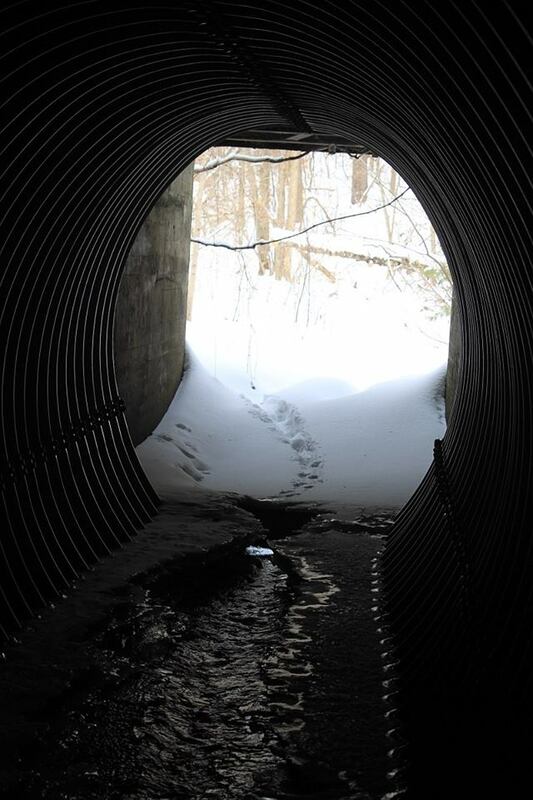 The tracks got lost on the other side of this culvert (culverts are well-known wildlife corridors), where the Otter had walked onto the ice of a pond and the wind had blown snow over the tracks. 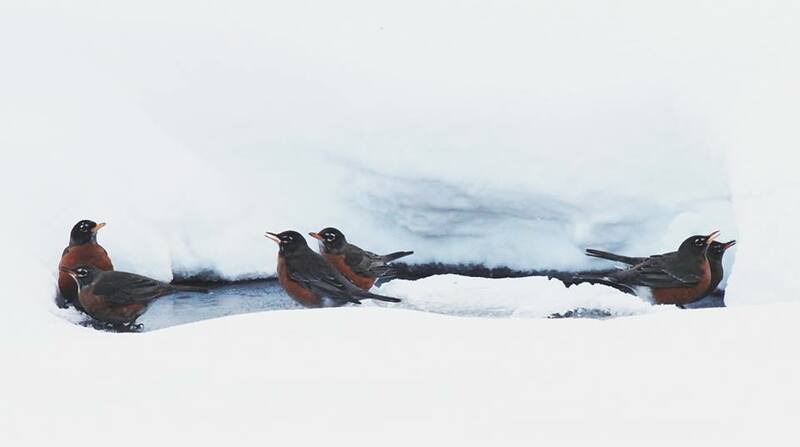 And who said that Robins move south in the winter? Well, not this winter! They were gathering to drink around the few open water sources on the farm in the middle of February. 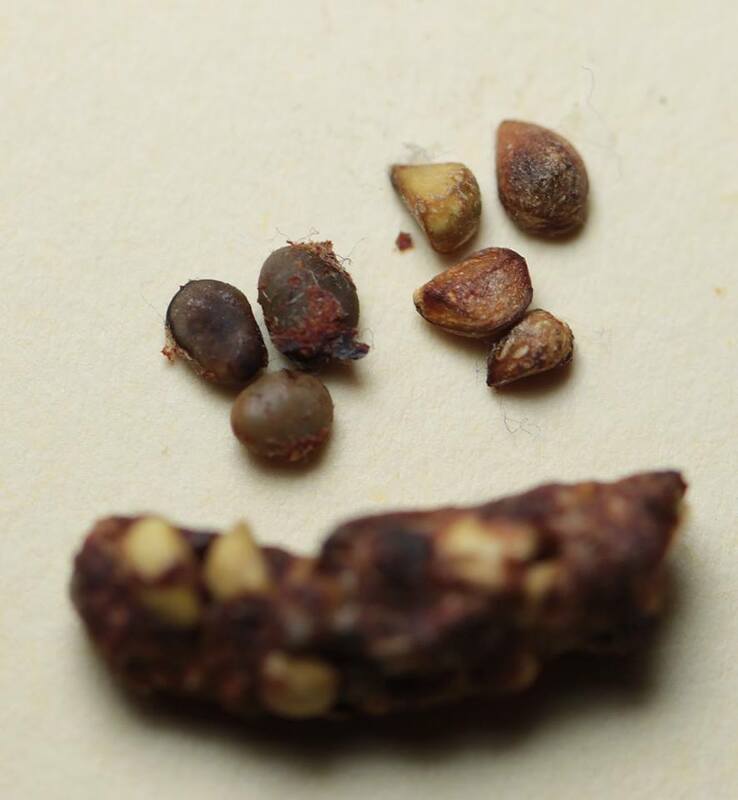 A closer inspection of the Robins’ droppings revealed that they were mostly eating rosehips of Multiflora Rose (seeds on the right) and the fruits of Staghorn Sumac (seeds on the left) at this time. Most of the seeds will have passed the bird’s guts undamaged and will soon be ready to germinate wherever they were dropped. Last fall was extraordinarily bountiful for all sorts of fruits and berries. This generous food supply might have been the reason why we saw Robins all through the winter, often in large flocks gorging themselves on Sumac fruits and also on rotten apples. 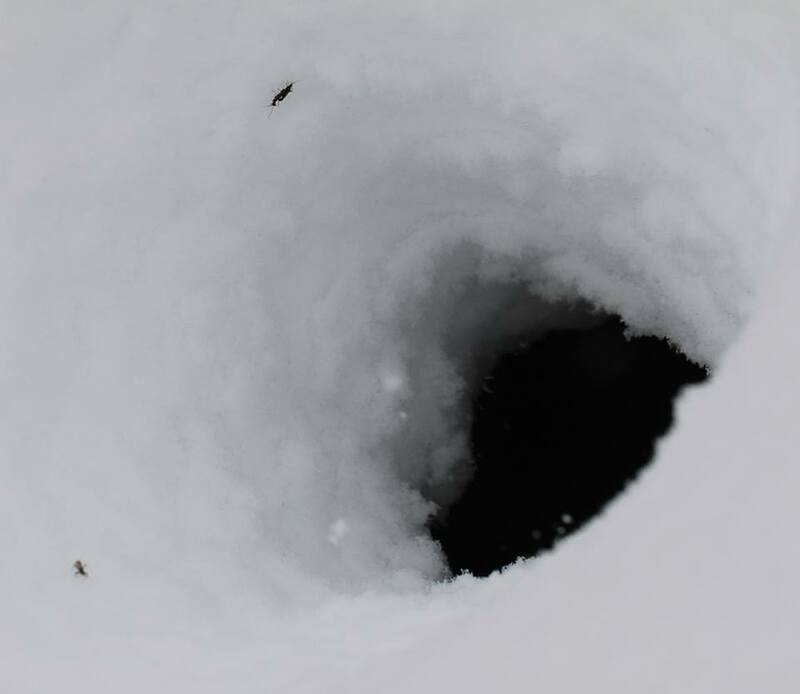 Water hole with insects on the snow around it. 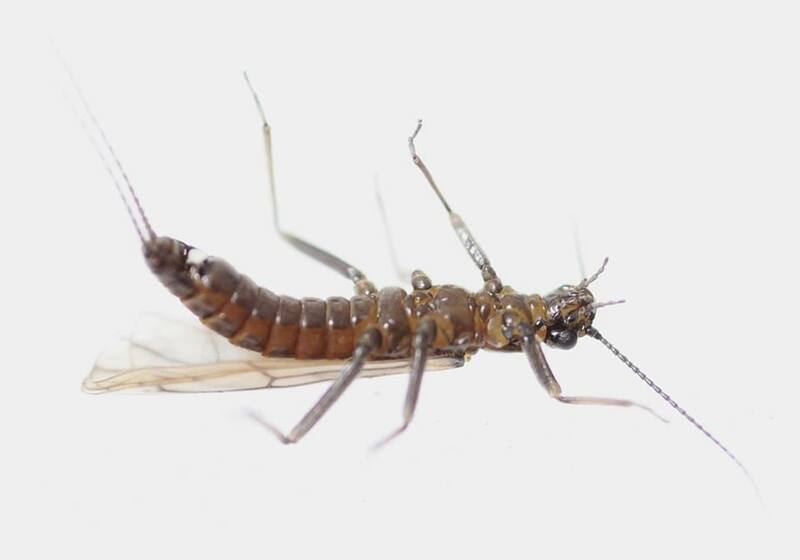 Winter Stoneflies are aquatic during their larval stage, but emerge from clean streams as adults in the middle of winter. 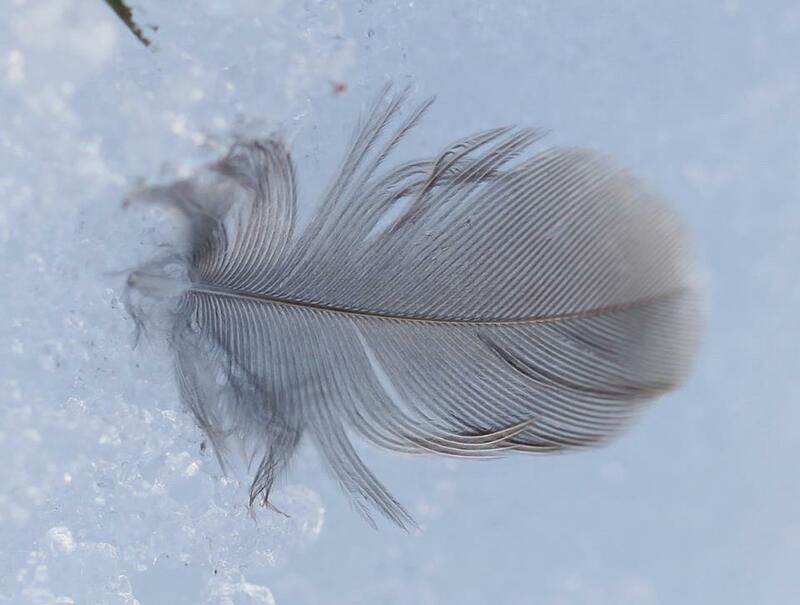 … and end their short life, right there, on the snow, in the middle of winter. 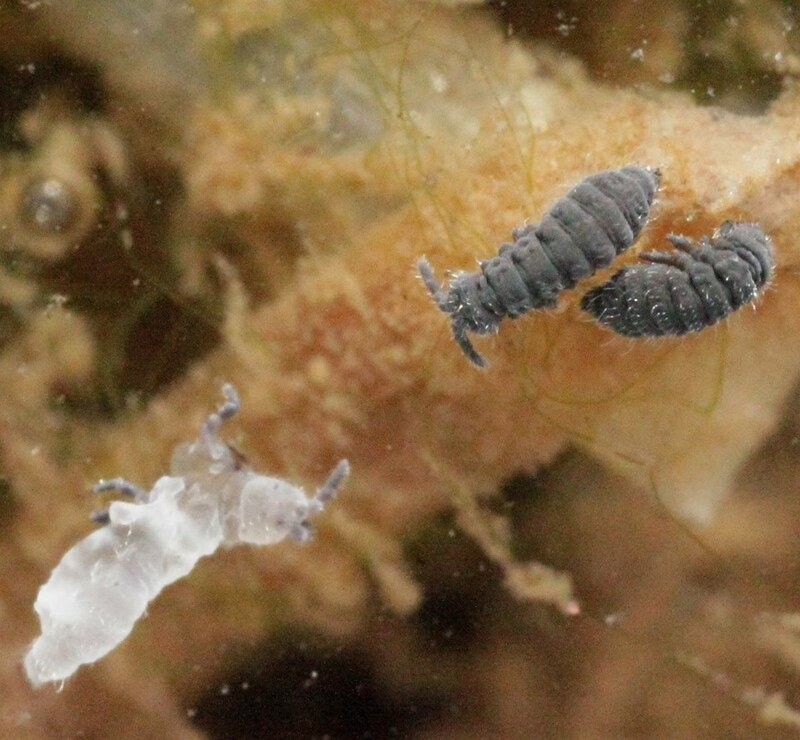 Even smaller “creepy-crawlies” which can be observed in the middle of winter are the snowfleas. 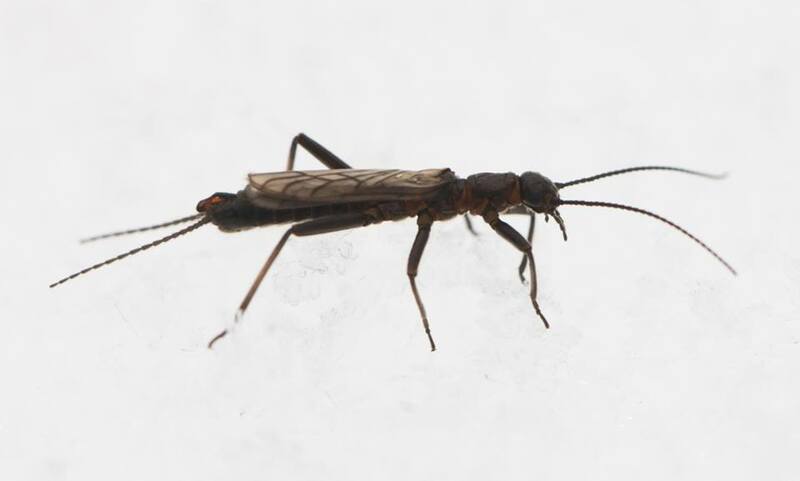 Often they jump about on top of the snow for now apparent reason. These guys were in a field puddle on one of our warmer days. 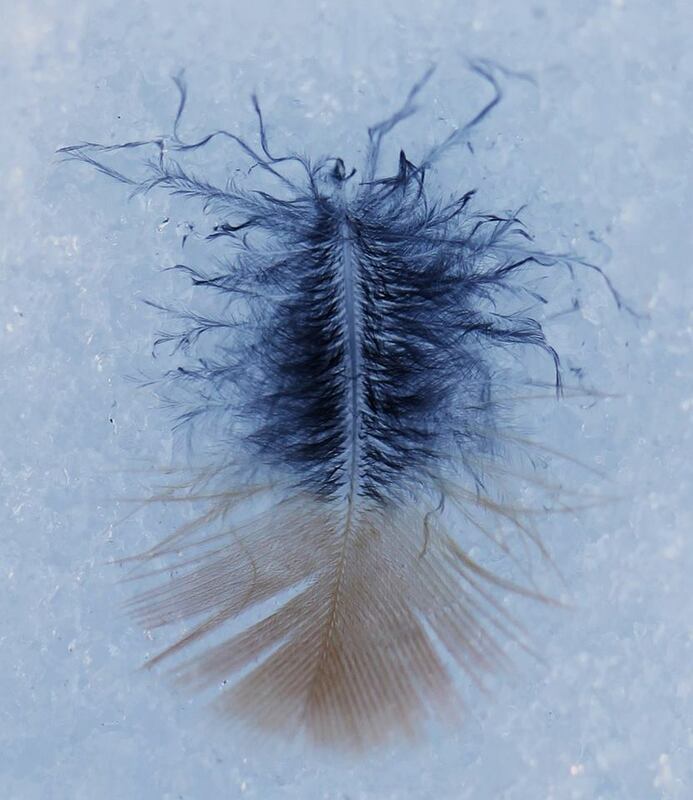 Note the empty skin in the bottom corner, which was left behind by a molting snowflea. 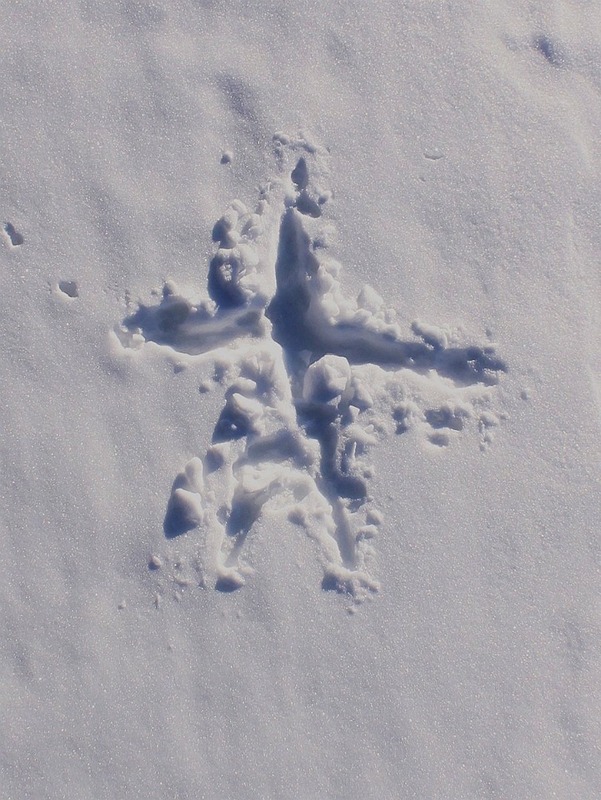 A somewhat bigger creature formed this small “snow angel” (which was no more than 6-8″ across). 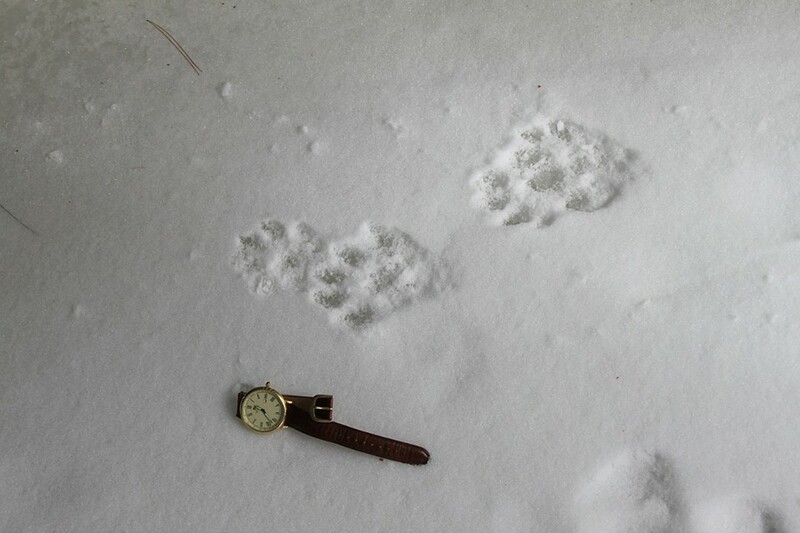 Upon closer investigation, Conrad concluded that this pattern was created by a vole who had ventured out onto a snow-packed field. 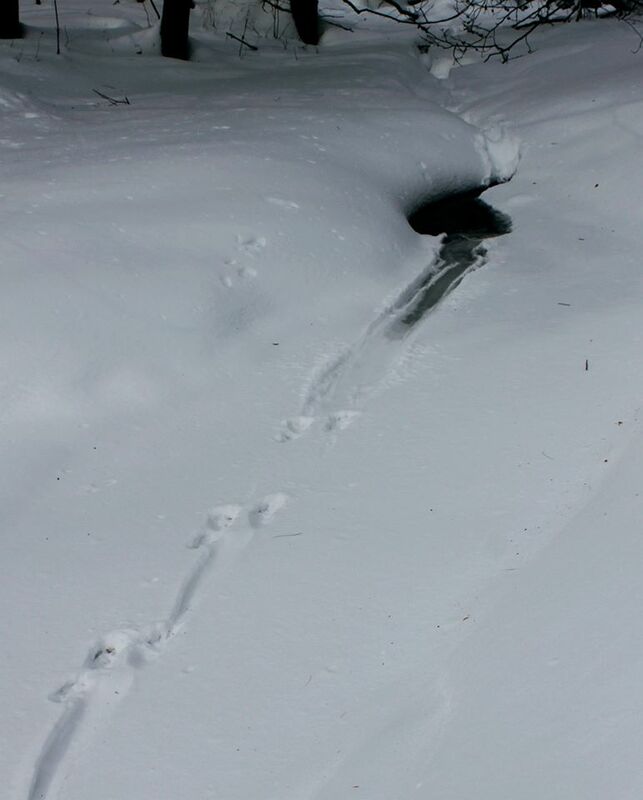 The Vole was above the snow, but periodically made ruts, like the one shown, into the snow. 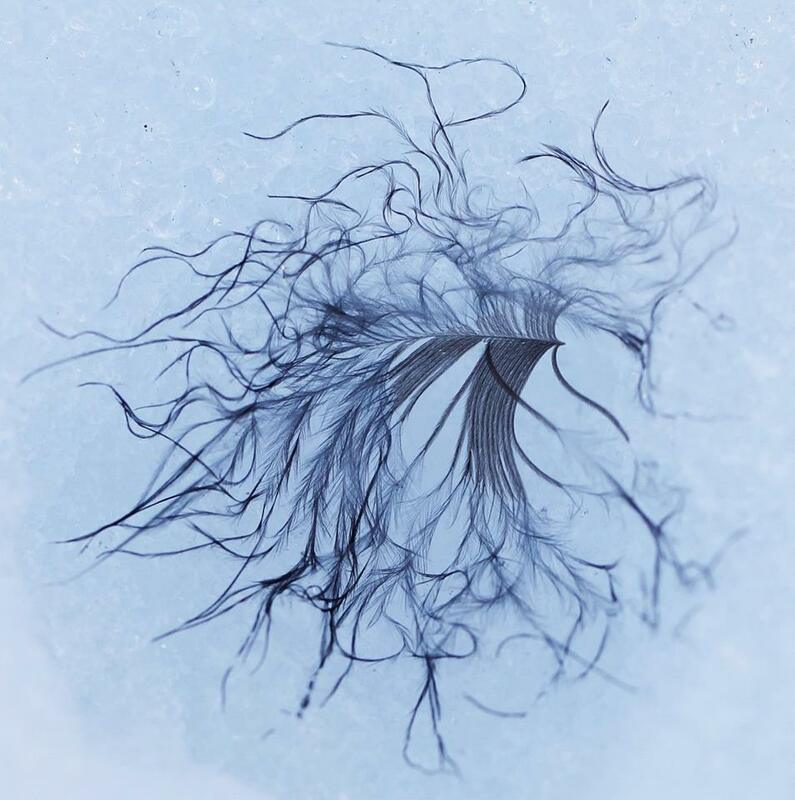 Mark Elbroch in his great book, Mammal Tracks & Sign, interprets similar sign as the tracks of a Vole looking to burrow below the surface but being stymied by an icy or hard-packed layer. 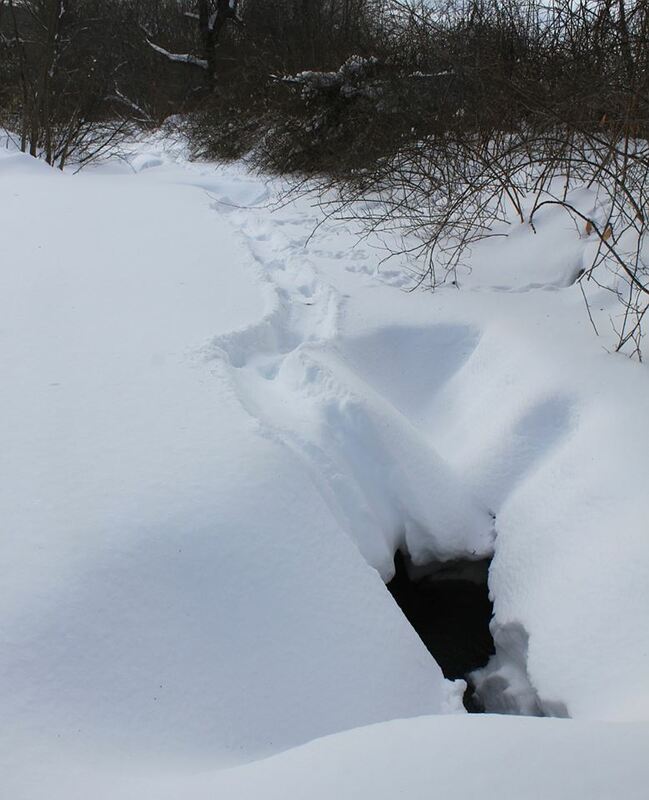 Voles are probably warmer and safer from predators when in ‘subnivean’ burrows. Why this Vole headed out into the middle of an open field, rather than sticking to the shrubby edge whence it came, is less clear. 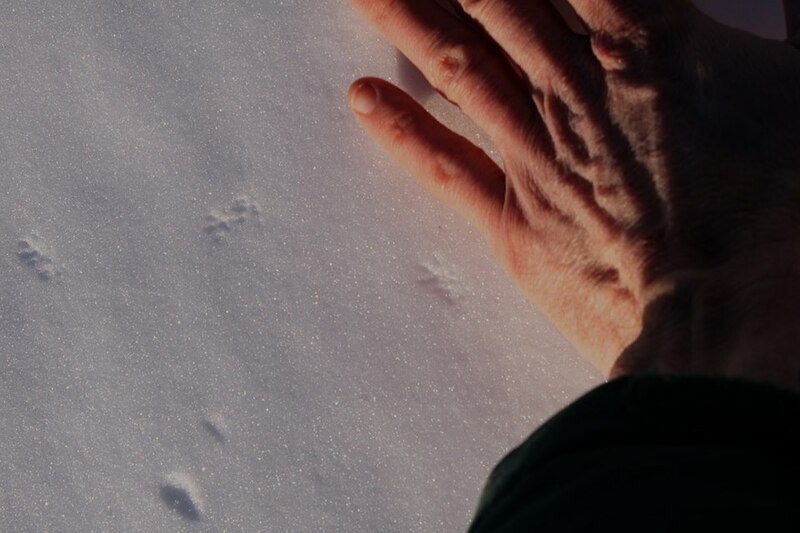 The tiny vole footprints were clearly visible on top of the snow crust nearby. Leatherwood (Dirca palustris) heavily browsed by deer. 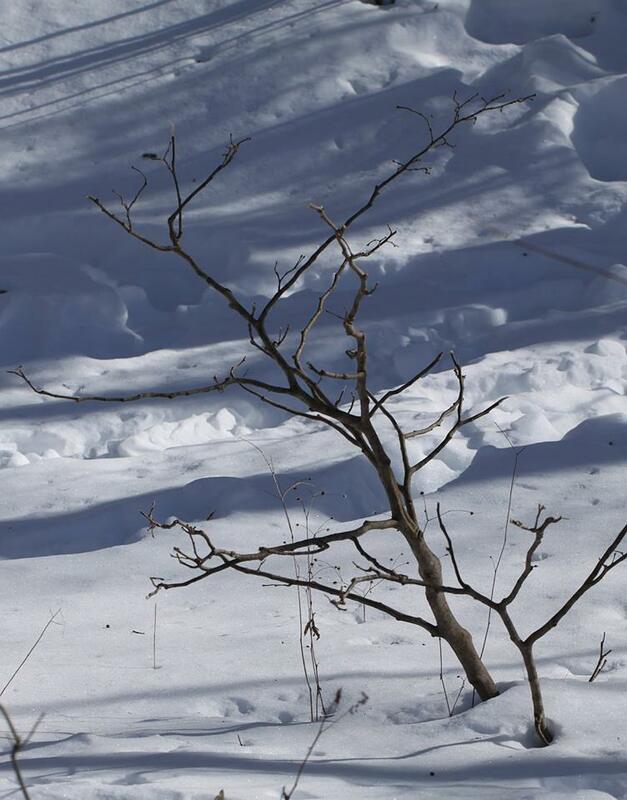 It was a hard winter for Deer, as witnessed by this Leatherwood shrub, which got heavily browsed. This beautiful little shrub is rarely seen in Columbia County, and one reason might be just that: Deer love to browse it! 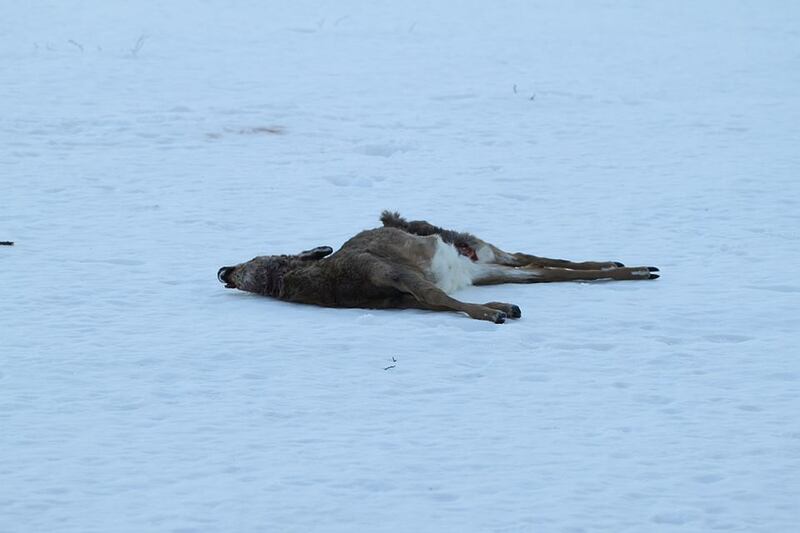 Killed Deer at Hawthorne Valley at the end of February. 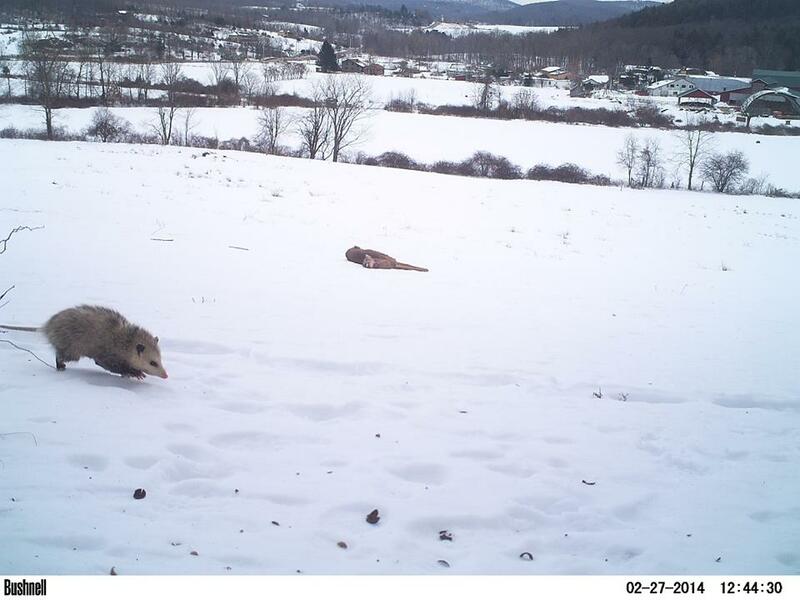 We placed a game camera near the carcass to document who all would come and feed on the dead Deer. Clearly, nothing goes to waste in nature and the Deer’s meat nourished a whole bunch of other animals during these cold days and nights. 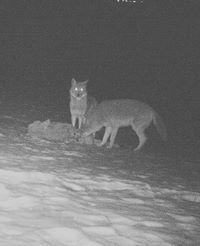 Coyotes feeding on Deer carcass at night. 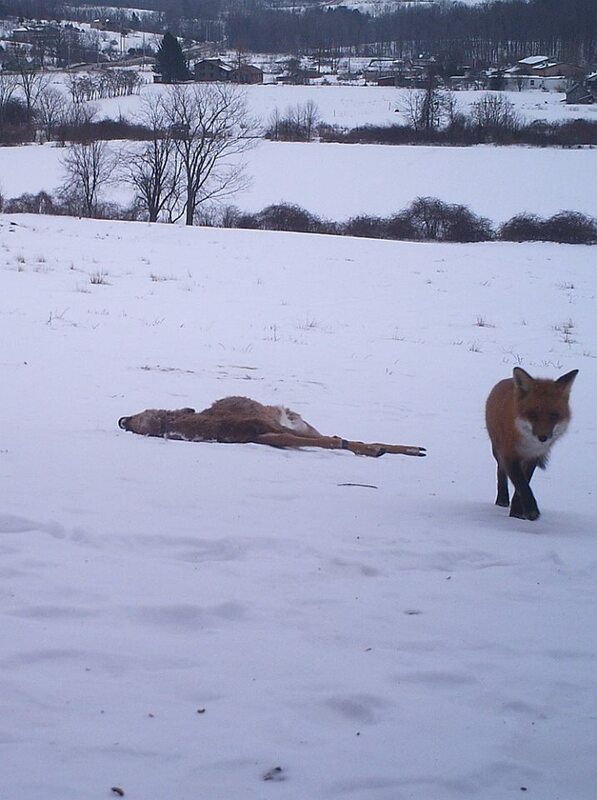 A Fox just had a meal during the day. 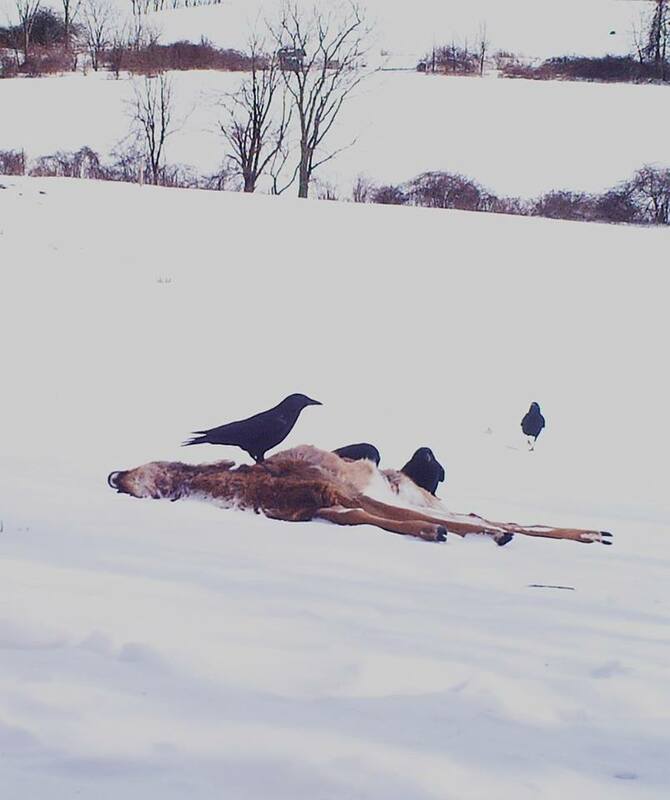 Crows frequently visited the carcass. 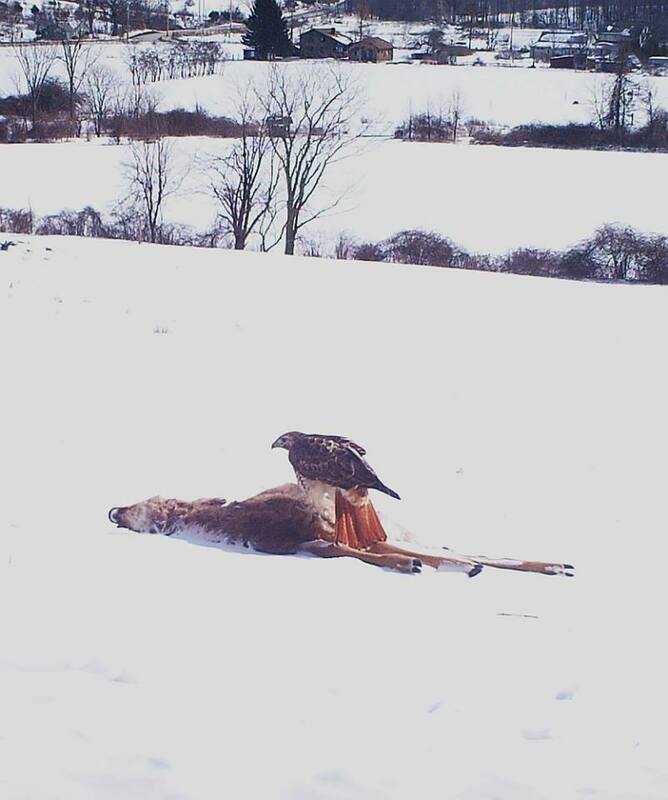 A Red-tailed Hawk got its meal. 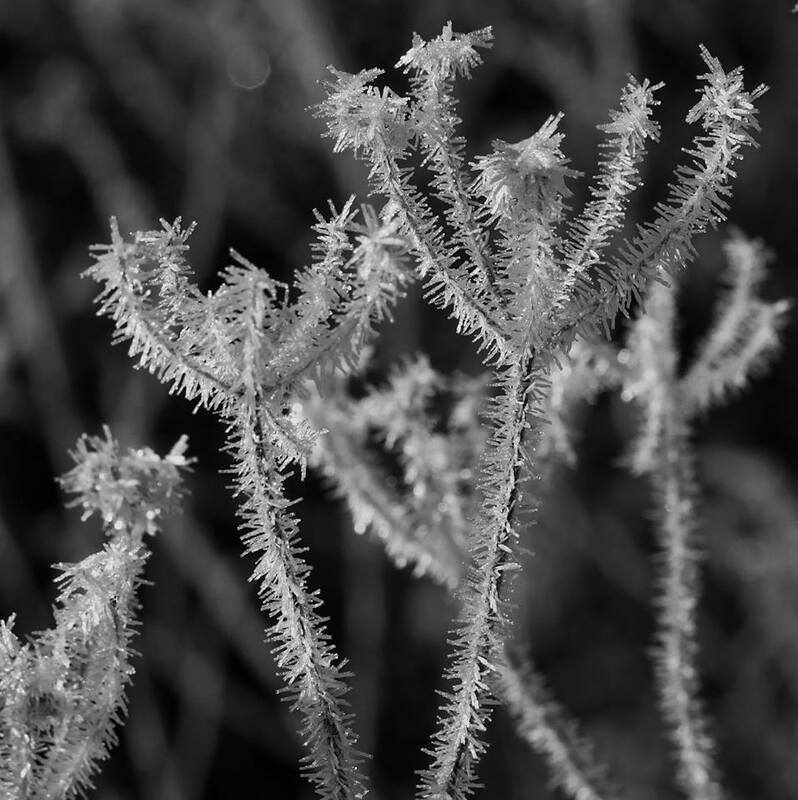 The next set of images is from a frosty morning, with surfaces that had been decorated by hoarfrost. The sun fast warmed the scene. 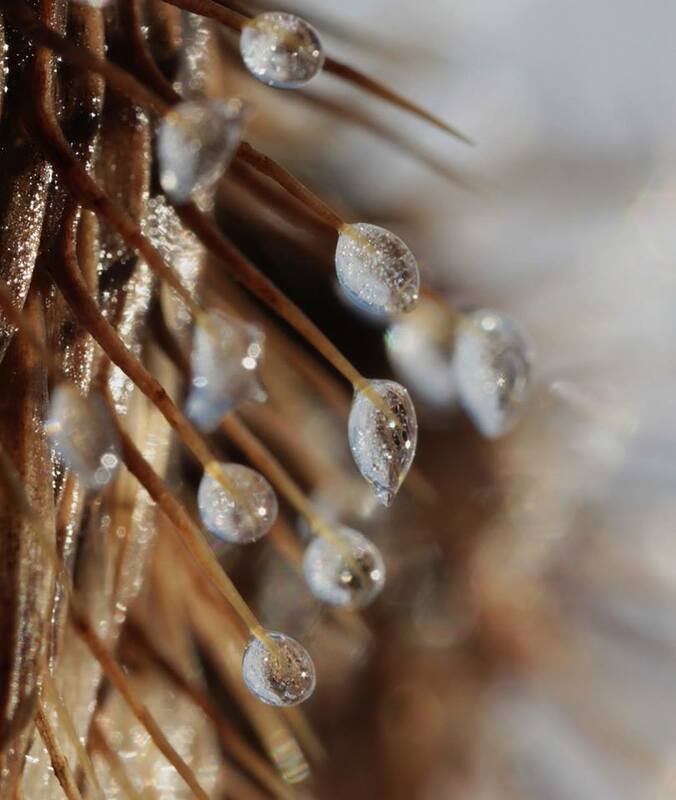 Crystals coalesced to drops and then, simply, to dampness. 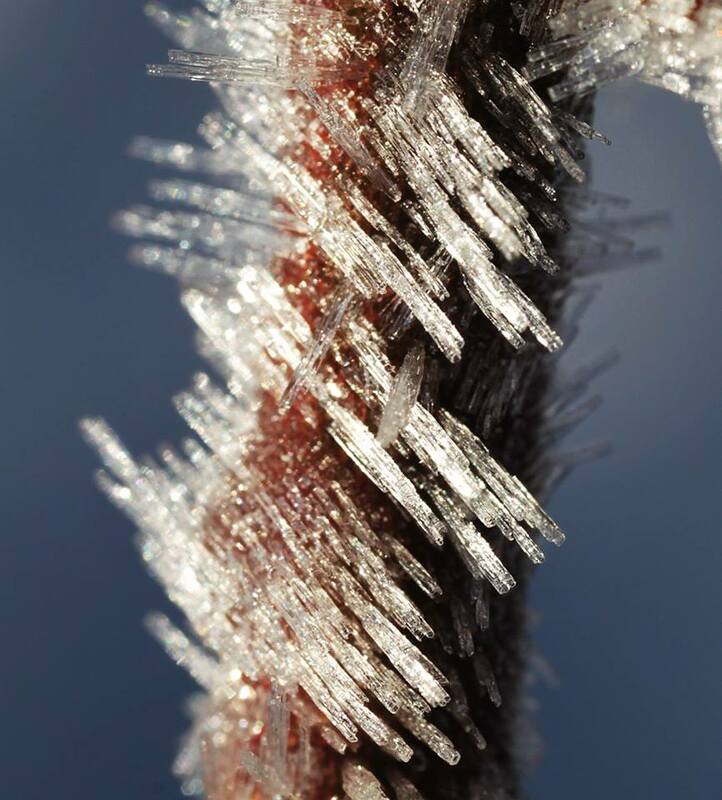 While some of these photographs are simply frosty (Conrad has a weak spot for ice crystals), the last one shows that edge between ice and water, between Winter and Spring. 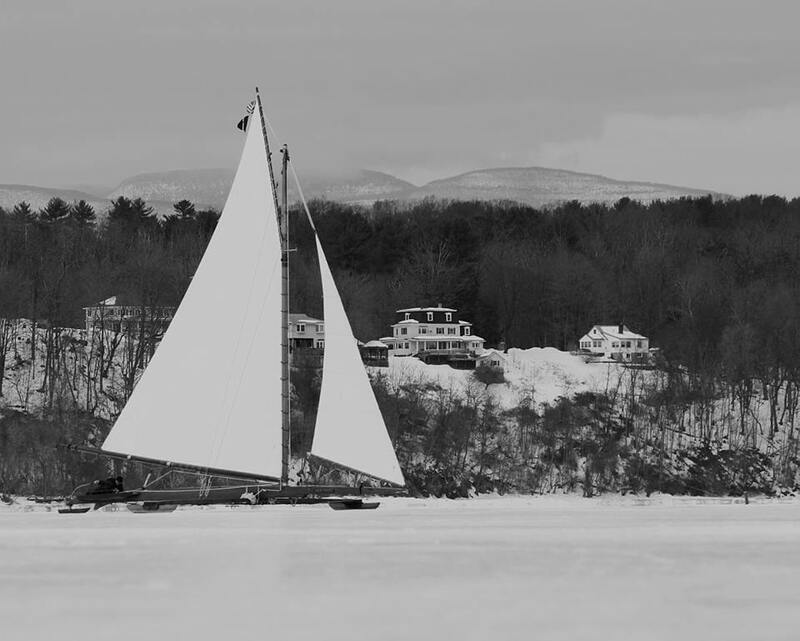 But winter wasn’t quite over yet. 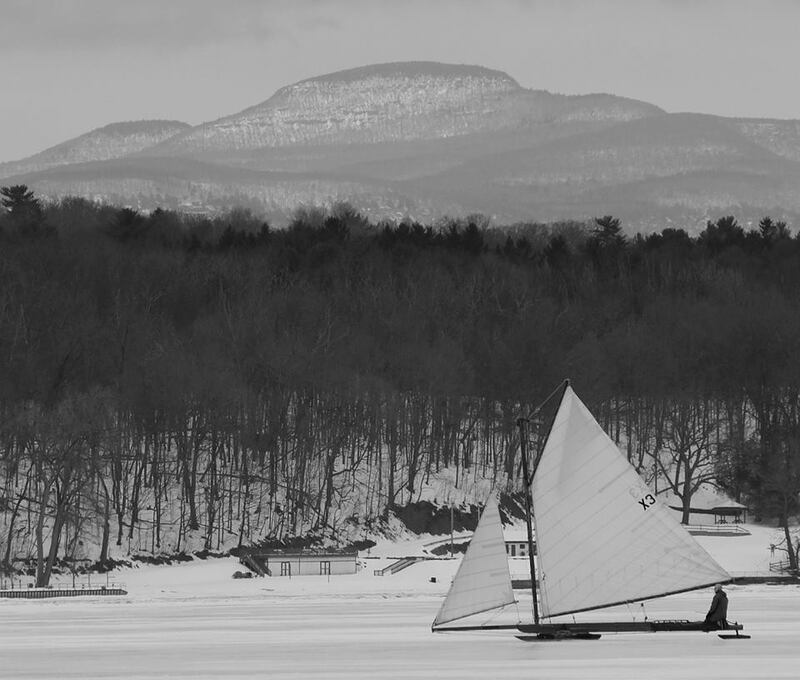 The first week of March brought ideal conditions for ice boating on the Hudson River, even if there wasn’t always as much wind as the ice boaters would have liked… We were fortunate to have been invited to come and see the ice boats on a stretch of super smooth ice south of Tivoli Bay and just north of the Kingston-Rhinecliff Bridge. 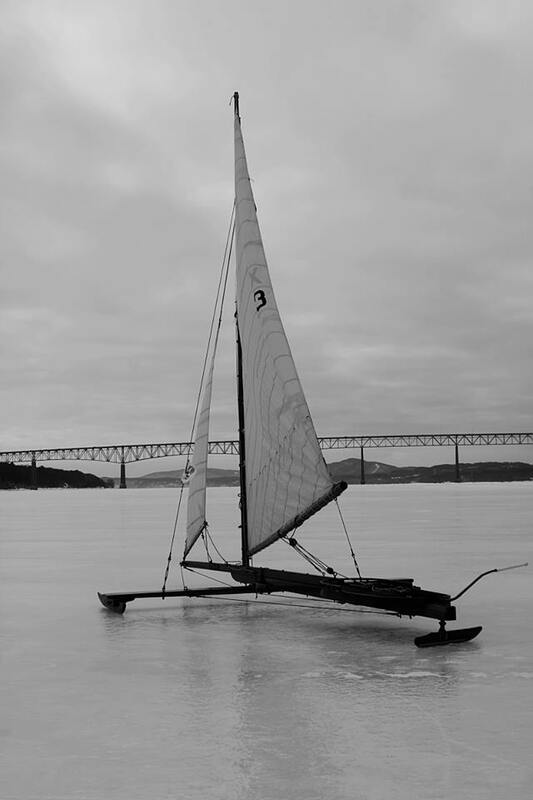 Apparently, ice boating on the Hudson River began by 1790, if not earlier. 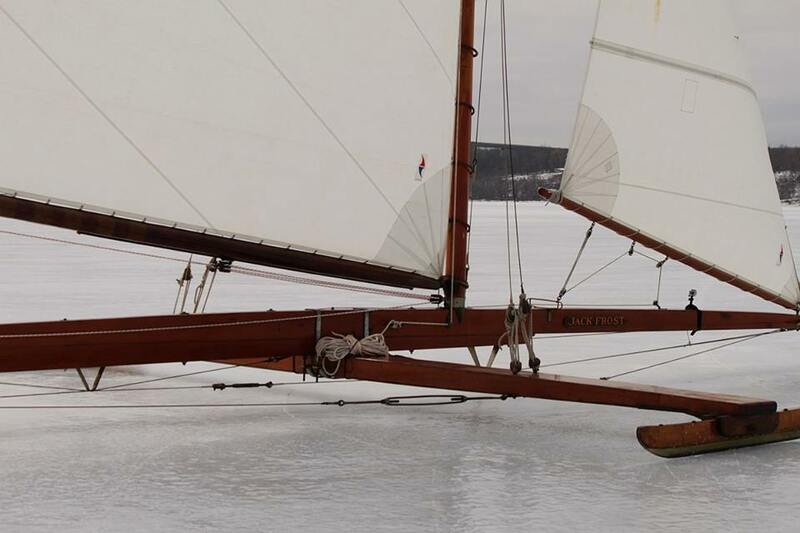 Although there is some reference to carrying cargo, it seems as if it has long been a sport. 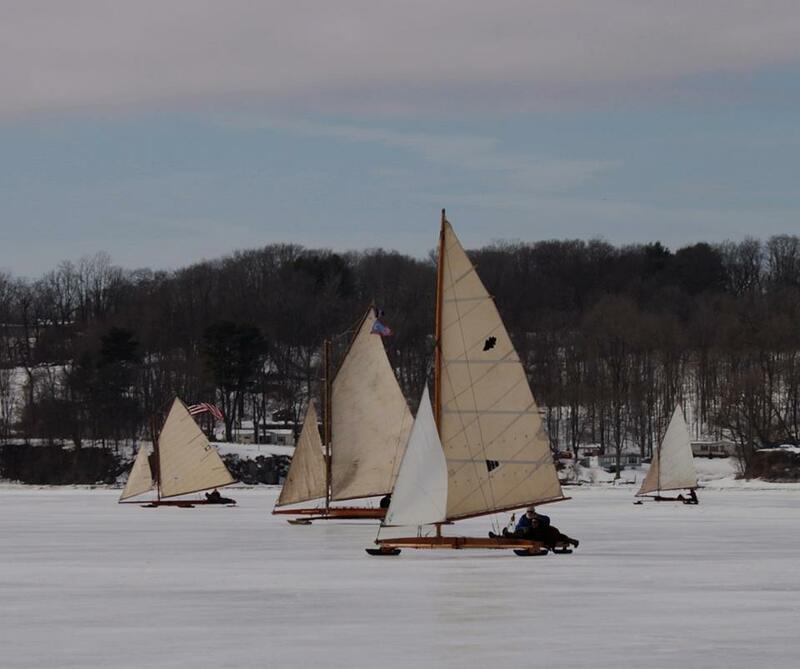 As Frank Wall, the ice boater who invited us to this mini-regatta, pointed out, in their day ice boats were the fastest man-made contrivance; this was an extreme sport. 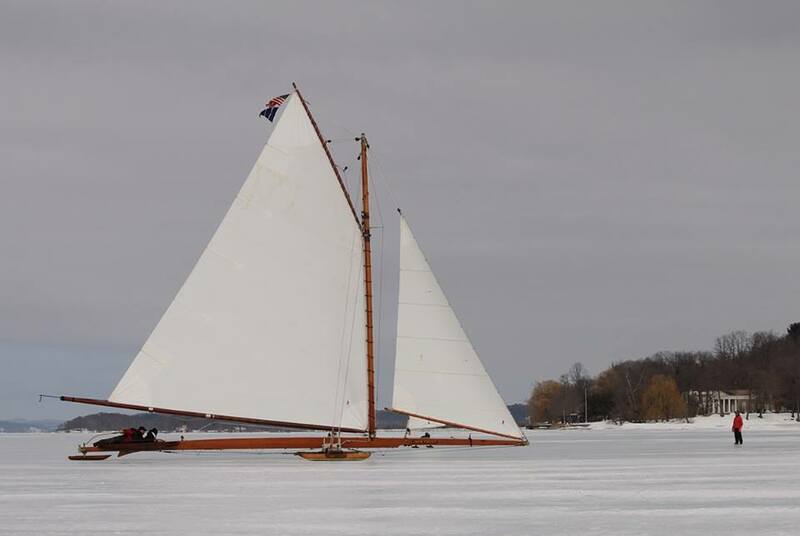 The big ships kept moving through their open water channel past the stretch of smooth ice where the ice boats were sailing. 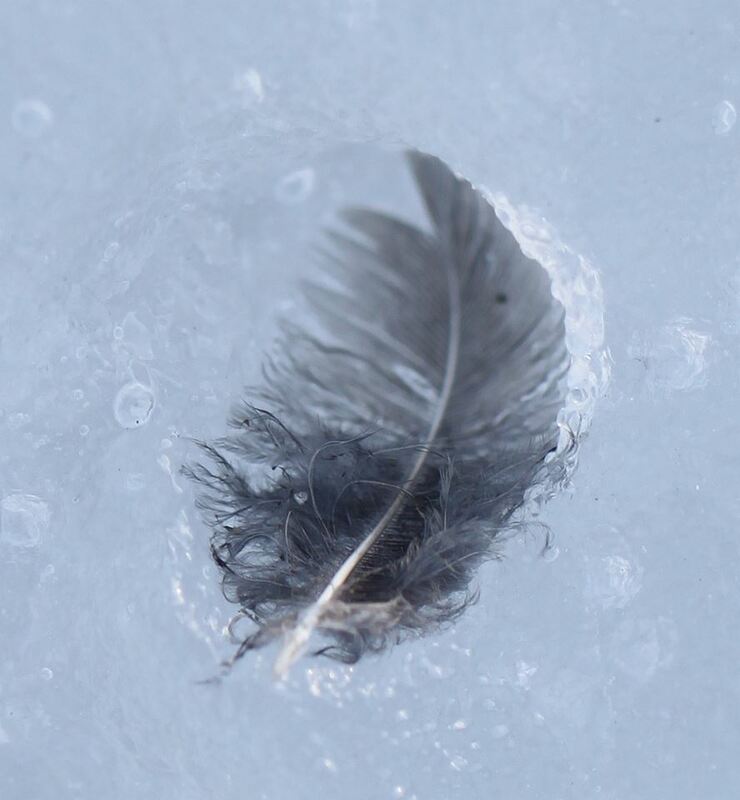 Finally, by the middle of March, we had some good thaws, which highlighted the ‘niveal flotsam’ (i.e., that which has been scattered upon snow). The sun warmed the darker objects, causing them to create little pockets. 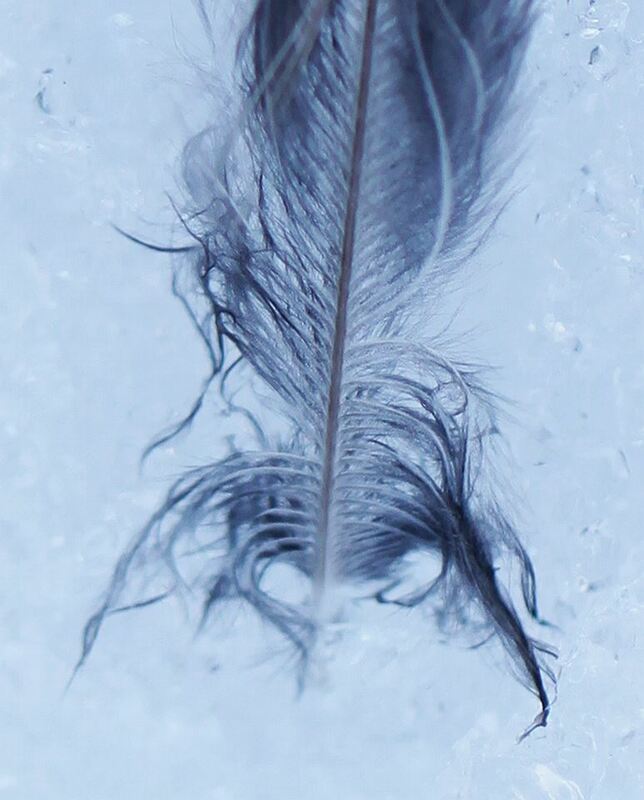 This series of feathers with their contrasting patterns of light airiness and wet-ratness seem to be a fitting summation of the conditions at this time of year.